Profiter résolument d’une période exceptionnelle ! The MLPD Central Committee recently met. The Rote Fahne (Red Flag) spoke with party chairwoman Gabi Fechtner about the discussions and resolutions. The government has allegedly gone over to "constructive work". Does that mean it has settled its crisis? The rightward development of the government and the bourgeois parties is being further intensified. At the same time, the government is trying out "confidence-building" measures. After the lengthy formation of the government and several open government crises, the rulers were initially concerned with stabilizing the government and the government parties CDU/CSU and SPD. After all, the existence of the grand coalition was on a knife's edge several times. In the background the business associations had been putting their foot down and insisting that the government should do the business of the monopolies properly. That is the core of the alleged "constructive work", and people are seeing through this better and better. Besides a lot of wind the government actually makes some real concessions. Otherwise their system of the petty-bourgeois mode of thinking would not work at all. Thanks to the enormous surpluses in present state revenues, it (still) has room for maneuver. The government thus presented the "Good Childcare Law". The SPD boldly announced the "respectful pension" and is trying desperately to get rid of its Hartz-IV trauma. The fact that it sees itself forced to do so is a great success for the Monday demonstration movement against the Hartz laws, that has now been going on for almost 15 years. However, the SPD is fully aware that various proposals which would be real improvements will not get through in the grand coalition anyway. A transparent maneuver! In response to the smoldering party crises, Angela Merkel and Horst Seehofer both resigned from their respective party chairmanship. For a time they managed to attain some peace in the grand coalition. Obviously, for now the rulers still want to hold on to the system of the petty-bourgeois mode of thinking as the main method of government. In their view, Annegret Kramp-Karrenbauer as CDU chairwoman is certainly better suited for that than Friedrich Merz. However, these measures have a limited effect. Because an ever larger part of the masses justifiably no longer believes the promises of the government parties. In the meantime, the deep crisis of confidence now affects the whole of bourgeois politics. This can perhaps be somewhat mitigated through single "confidence-building" measures, but cannot be overcome. This situation expresses the conflict of the rulers: without a minimum of agreement with the masses and their participation, the dictatorship of the monopolies under the cover of bourgeois democracy cannot function. Neither can modern production. The intensification of the inter-imperialist competitive struggle at the same time forces the rulers to accelerate their rightward development and attack the working class. Several corporations such as Daimler or VW have plans, or have even begun, to dismiss hundreds or even thousands of temporary workers as a first measure. At the Opel factories in Eisenach and Rüsselsheim top management aims at massive reduction in apprenticeships. Exploitation is being sneakily and massively intensified everywhere. The dictatorship of the monopolies is being enforced more and more openly: VW is protected from providing any compensation for diesel drivers. None of the main culprits of the criminal exhaust fraud have yet been made accountable. The new police laws are not applied to terrorists, but are currently being applied primarily to militant environmental activists – in order to enforce the policies of the energy corporations. The demand of the employers' associations to maintain East Germany as a "low-wage country" is met and – despite increasing protests – the alignment of wages and social benefits denied. An ultra-reactionary general attack is being prepared in refugee policy. With their "workshop talk", the CDU/CSU demagogically act as if they were responding to the "need for security" among the masses. They want to push through more and faster deportations, an extension of the allegedly "safe" countries of origin – i.e. deportation to catastrophic conditions; the criminalization of refugees through their imprisonment, even together with criminals; easier withdrawal of the German passport in the case of dual citizenship; restriction of democratic rights and freedoms of refugees by reducing the possibility of legal action, and so on. This ultra-reactionary package and the aggressive jargon in which it was drafted underscores that the rightward development comes directly from the government and the monopoly parties. All this is taking place within the framework of the rightward development of many governments in Europe and the institutions of the EU. Under the flag of "acting as a united Europe", Germany plans to further reduce its arms export controls and restrictions. Plans for an EU army are made socially presentable. Against impending driving bans, the German government boldly announced the "flexibilization of regulatory limits" for nitrogen dioxide emissions. And the EU Commission "kindly" waived an objection. In the campaign to the European elections, we must really make the masses aware of all this and it must be fought across borders. How does this fit into the so-called "world disorder" that is being talked about increasingly? The term "world disorder" is misleading, because what we are currently experiencing is what the "order" of the imperialist world system and its crisis-prone existence produce by law. After the world economic and financial crisis from 2008 to 2014, a fluctuating stagnation has developed in the world economy. This is still going on. However, meanwhile clear signs of a new world economic and financial crisis are taking shape. In November 2018, industrial production in Germany and the Eurozone declined for the first time in years – in comparison to the previous year as well. Growth in gross domestic product (GDP) also fell significantly in the last two quarters compared with the same period of the previous year. The incoming orders of German industry, which always also provide information about future developments, have fallen almost continuously since August 2018. On the stock markets uncertainty is very high, and the banking and financial sectors are marked by increasing instability. In January 2018, worldwide stock market capitalization reached a new record high of USD 89.8 trillion. Since then there has been a downward trend with fluctuations. The last peak in stock market capitalization was reached in October 2007, exactly one year before the outbreak of the last world economic and financial crisis. However, it is not the concrete ups and downs in production or on the stock markets that are the main feature of a crisis outbreak. These are even characteristic for fluctuating stagnation. The decisive criterion for an overproduction crisis is an uncontrolled, rapid decline due to a drop in production and investment to the level of many years before. Just remember the drastic slump in world industrial production of 20 percent in the fourth quarter of 2008. It has not yet come this far. Economic development in some imperialist countries such as the USA still seems relatively stable. However, there are already indications that the trade war will also have a negative impact in the USA. There are a number of factors that could initiate a crisis-like drop, such as an uncontrolled Brexit or a drastic intensification of the trade war initiated by the USA. Fluctuating stagnation can delay a crisis, but its collapse will then be all the deeper. In interaction with this, the potential for crisis-prone structural changes in the imperialist world economy should by no means be underestimated. The international structural crisis based on the reorganization of international production is one of the main driving forces of the transition to a new world economic and financial crisis. It means an enormous, albeit controlled, destruction of capital – with severe consequences for the masses. At the same time, new structural crises are developing. First of all, the introduction of e-mobility is beginning to have its effects. Secondly, another international structural crisis is emerging on the basis of the digitalization of production, trade, communication and society. According to bourgeois estimates, alone through the transition to electric drives in the present production of motors and gearboxes in Germany, up to 100,000 jobs can be destroyed. Here a "dangerous brew" is emerging for those in power: the interaction of structural crises and an impending overproduction crisis in interaction with political crises. The transition to a global environmental catastrophe also holds enormous crisis potential. At the same time, both politically and economically, the likelihood of a new edition of a globally coordinated crisis management, as in 2008, has decreased considerably. It can therefore be assumed that economic crises will in future again develop more directly into political crises. Pertaining to political power, the intensification of inter-imperialist contradictions is reflected in the general tendency towards imperialist war preparation. Increasing arms budgets, exploding arms exports; increased readiness to resolve inter-imperialist contradictions militarily and to violently suppress liberation struggles; reopening of the nuclear arms race or the threat to Venezuela's sovereignty posed by an invasion of US imperialism. All this documents the preparation of the imperialist powers for violent major conflicts. There are always discussions as to whether one can speak of a progressive change of mood in the face of this social polarization. How does the Central Committee assess the development? The deep crisis of confidence of ever broader sections of the masses is directed against all bourgeois politics. Its core is a growing criticism of the role of bourgeois politics as a service provider to the dictatorship of the monopolies. Because it implements the demands of the monopolies in environmental, transport, health, housing and social policy. Far more people than those who are already active in the progressive change of mood feel this resentment against bourgeois politics. The social polarization is expressed among the masses in two sides, which in turn influence each other: Some of the masses are influenced by the rightward development of the government and the bourgeois parties. Where class consciousness is still underdeveloped, chauvinism, modern anti-communism, division and, in part, the racist incitement by the ruling powers can take effect. A larger part of the population, however, feels challenged in a progressive direction by the government's rightward development. The spontaneous trade union, internationalist, environmentalist and rebellious consciousness have awakened on a broad front. The progressive change of mood is thus developing precisely in view of and as part of the social polarization. At the same time, it is characterized itself by a struggle over the mode of thinking to correctly evaluate both attacks and concessions of the rulers. However, not in every concrete situation is the progressive change of mood the main side of social polarization. This must be analyzed in each case. In the year 2018, the workers' and people's struggles together comprised 3.78 million people. This is quantitatively comparable, for example, with the 3.9 million people involved in 2004, when the politically independent Monday demonstration movement against the Hartz laws emerged. But what is especially important is the higher development in quality. In 2018 the struggles were increasingly directed against the entire range of the rightward development of the government and the bourgeois parties. They thus took on a more political character. It is also striking that many struggles take or took place not in response to direct attacks. They take place against the backdrop of many years of relative economic stabilization – with maximum employment and a whole number of concessions. This is an expression of a higher level of consciousness; higher, for example, than in the 2004/2005 struggles against the Hartz IV laws, which were directed against an immediate and tangible impact on millions of workers and unemployed. The working class is at the forefront of the struggle against the rightward development of the government and bourgeois parties. This is reflected in strong trade-union workers struggles, but also in the role of the MLPD as the proletarian and revolutionary backbone of the movement. For the rulers and the right-wing union leadership, various strikes had a surprising impact. They could not so easily be kept within the planned framework of bargaining tactics. Thousands of trade unionists of the railway and transport union EVG, who took part in the strike, found that their determined strike was bringing all of Germany into disarray. The rejection of the collective agreement by the 23,000 security guards at airports was for reasons of solidarity, because the aim was to exclude parts of the workforce from improvements. At the beginning of 2019, the progressive change of mood continued to develop – despite various concessions and attempts by the rulers to subdue it. Once again, trade union struggles in militant collective bargaining rounds are characteristic. With the "Fridays for Future" protests by tens of thousands of schoolchildren and students in 2019, the rebellion of young people is coming to the fore even more strongly. The spontaneously awakened environmental consciousness on a broad front is expressed in various demonstrations and protests. The significantly higher participation in Lenin-Liebknecht-Luxemburg activities in January and the presence of the MLPD and the Internationalist Alliance as the strongest bloc show that the revolutionary pole in the progressive change of mood is strengthening. The refugee solidarity of millions of people is unbroken. Even if – or precisely because – the social polarization is particularly evident in this question. As the spearhead of the democratic refugee movement and solidarity, a nationwide solidarity campaign has developed with a leading representative of the democratic refugee movement, Alassa Mfouapon. It stands in direct confrontation with the ultra-reactionary bourgeois refugee policy allied with the Bild newspaper. The self-organization of the refugees not only defends itself, it also goes on the offensive against the martial police attack in Ellwangen on May 3, 2018. The MLPD has undoubtedly become more well-known and has gained influence. But attacks on it are also increasing. Didn't that weaken positions that had been attained? In all these struggles the MLPD and Rebell are not only active, but often take initiative and exert influence. With the progressive change of mood modern anti-communism, as the core of the system of petty-bourgeois mode of thinking, continues to lose its effect on the masses. A look at France and the "Yellow Vest" movement there makes it clear how a political fermentation process can emerge. In Germany, too, the development of objective and subjective factors has definite potential to mature into a revolutionary fermentation. The potential of the MLPD for gaining growing mass influence in the transition to a revolutionary fermentation has not escaped the rulers' attention. They have taken targeted measures against this: In connection with the Rebellious Music Festival at Whitsun 2018, a new quality of attacks on the MLPD by the rulers developed. At present, they still confine themselves to putting obstacles in our way, damaging our work or defaming public representatives of the MLPD. One must speak of an initiated concrete tactical change in tactics of the rulers towards the MLPD. This includes the considerable obstruction of the work in the party headquarters "Horster Mitte" by the unspeakable ban on the use of the cultural hall; and this goes as far as the cancellation of bank accounts, police reports and other attempts at criminalization. But the more it became clear that this does not intimidate us, and the relevance of the MLPD continues to grow, the more an aggressive, overall societal liquidationism was brought up against the MLPD. In a rough manner and with schemes, we were attacked and attempts were made to oppress us. Sometimes we were forced out of alliances like "Unteilbar" by physical force; attempts were made to stop the appearance of the MLPD and Rebell at demonstrations, to ban their flags or even to destroy them. The actors are agencies of bourgeois politics, often mainly members of the SPD, the Greens or the Left Party. They make, at least objectively, common cause with intelligence forces and bourgeois media, spread their terminology against the MLPD and so on. In addition, "anti-Germans" in particular are spreading vicious smears that the MLPD is supposedly anti-Semitic because it supports the Palestinian liberation struggle. There have been several media campaigns to denigrate the MLPD and the Internationalist Alliance, including the Bild newspaper or an ultra-reactionary connection around allies of the proto-fascist Israeli Netanyahu government. Certainly, these attacks also have an intimidating effect on some of the masses. And their goal is above all to hinder the building of the party. However, these destructive forces have had to suffer some setbacks. The price the rulers pay for these attacks on the MLPD is: Their policy of denying the existence of the MLPD has been severely impaired. Many people are now even more interested in the "notorious" MLPD. Among the masses today it is often no stigma to be attacked by the rulers – but rather a sign of quality. Of course, breaking through the relative isolation of a Marxist-Leninist party in an imperialist heartland will never be applauded by the state-supporting forces, nor will it be accompanied by jubilant reports in the bourgeois media. On the contrary, the new societal role of the MLPD will only be won in the surging wave of intense social polarization! 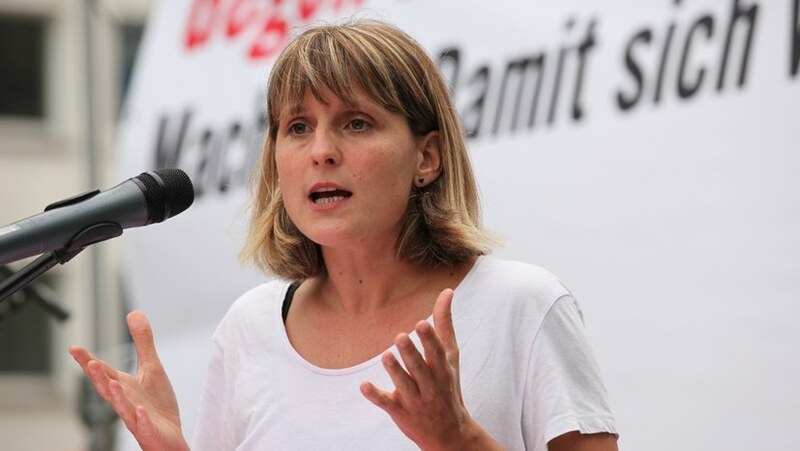 Alarming are the murder threats against Monika Gärtner-Engel, the responsible person for internationalism in the Central Committee, which have been increasing since December. There have also been attempted murders of two other representatives of our party. Tires were professionally punctured in order to cause accidents. There were also fascist attacks on our party headquarters. That means that the MLPD is more strongly targeted by the fascists. However, it remains a dream of these fascist criminals that we will be misled or intimidated by that. The way we successfully dealt with this, the clear stand against such attacks strengthened the esteem, the self-confidence and also the clear stance of MLPD and Rebell. We experienced broad solidarity and support, in the organization and in the population. And we received many donations against these attacks. I would like to take this opportunity to express my grateful thanks for this! To come back to the question: The social polarization, in which the fronts are clarified, clear positions and backbone are required, is even a suitable environment in which the MLPD has been able to strengthen itself and will continue to do so. But with all these activities – isn't there a danger of overtaxing one's forces? In fact, this development has unmistakably put on the agenda the strengthening of the forces of the MLPD. This is necessary, but also possible! We have to think about tomorrow and the day after tomorrow. Our work on 100 years of the November Revolution, the commemoration of the murder of Karl Liebknecht and Rosa Luxemburg has made it very clear to us: The strong, experienced and steeled Communist Party with firm ties to the masses cannot and must not first emerge during revolutionary upheavals. Today we are already a good step further, and the MLPD can look back on 50 years of revolutionary history. It has convincing answers to the increasing questions of the masses for a social alternative, and it self-confidently stands for a socialist society. But it is simply not strong enough yet. Since the last party congress it has been able to strengthen its membership by eleven percent. But firstly, this is far from sufficient, and secondly, our organizational state is not yet consistently orientated towards building work. Without a doubt, there are many more people who are searching for us, but have not yet found us. Last year, we already focused the party more on recruiting new members. However, the Central Committee of the MLPD found self-critically that the measures taken so far were still insufficient. It is not just a question of attitudes towards party building or good initiatives. Whether we make a big step forward here also depends on the organizational-political prerequisites. We have therefore decided on a concentrated phase of reorganizing the MLPD in order to focus it on accelerated and awareness-raising building work. There is clearly a growing potential for a greater level of organization. Especially where struggles took place last year, the degree of union organization increased significantly. The willingness among young people to organize is growing again. This is also reported internationally by revolutionary parties, for example on a trip to Latin America by Stefan Engel and myself at the end of last year. Often they succeed – in connection with a progressive change of mood and mass movements in their countries – in strengthening their organizational power. This organizational work among the masses is not "self-interest" of the MLPD, as some anti-communists claim. With its reorganization the MLPD underlines its social claim to help the masses to draw the right conclusions from the situation. The struggle against the rightward development of the government and the bourgeois parties, for the revolutionary overcoming of capitalism, and for building a society without exploitation and oppression – this can only be successful in an organized way. A situation in which the need for consciousness and the willingness to organize are growing is something we must use purposefully! It is not equally possible in every situation to build up the party at an accelerated pace. For a time it was also correct to consolidate and develop the work primarily in the previous structures. But now is the time to build! The CC should have taken this into account earlier. What is meant by awareness-raising and accelerated building work? As a Marxist-Leninist party, we have the task of working to raise awareness. This applies to all levels of consciousness: It is necessary to awaken, consolidate and develop spontaneous consciousness to a higher level. This must manifest itself in the organized consciousness with which people unite in the trade unions and other non-party-affiliated self-run organizations of the masses, and not least in socialist consciousness. This is expressed in the organization in the Marxist-Leninist party. It is therefore a question of thinking in processes: How does consciousness develop in interaction with organization – and how can we systematically influence it? Awareness-raising also means to come better and better into agreement with objective reality through the conscious application of the dialectical method in order to be able to change it. Awareness-raising building work helps the masses to cope with the demoralizing, disorienting and disorganizing effects of the system of the petty-bourgeois mode of thinking. In order to better take into account the transitions in consciousness, we will also differentiate more precisely the tasks of our party groups. So far, we are active in 500 cities, including the largest and most important – but there are a total of 11,054 municipalities in Germany, including 2,056 cities. We must therefore again "conquer" new areas, cities, companies, universities and also urban areas for our party work with greater determination. Many new building groups will be created for this purpose. Our focus continues to be on the 500 largest enterprises of the international (super)monopolies in Germany, in which the international industrial proletariat is concentrated. But there are also changes in their structure. This has led to the development of huge logistics centers. 81,000 people work at Frankfurt Airport alone, and logistics companies have created new, militant workforces, such as at Amazon. Marxist-Leninist youth work remains the mass tactics of party building. Today, a large number of young people are concentrated at universities, 175,000 in Berlin alone and 39,000 in Essen/Duisburg. We combine this reorganization with a membership recruitment initiative, especially among young people, women and the working class. This initiative has already begun successfully. Everyone is invited to become a member of the MLPD in such eventful times. Extraordinary times require courageous decisions! The reorganization also interacts with the tasks in class struggle: the broad public relations work in the tactical offensives for the European elections and the state elections in Thuringia, the struggle against the rightward development of the government and bourgeois parties, against the accelerated transition into a global environmental catastrophe, and against the intensified attacks in the enterprises and on bourgeois-democratic rights and freedoms. The reorganization will give us much insight into what further changes are needed, such as in guidance and control, and in training and educational work. A lively and creative spirit of departure full of ideas can already be felt throughout the party. What other tasks has the MLPD decided to take on? Both among the masses in Europe and worldwide, broad education is required about the development of the imperialist world system – and concretely about the imperialist and especially insidious character of the EU. We so also carry out a task set by the last ICOR World Congress. Of course, we will also use the European elections to intensify the cross-border cooperation in the ICOR Europe and to strengthen the ICOR. At Whitsun a highlight of the youth work is awaiting with the Whitsun Youth Meeting – for the first time in Thuringia. The timely organizational work in local preparation groups in Thuringia – taking over tasks and contributions in the whole spectrum of the youth rebellion – and the mass mobilization are the benchmarks for a successful work. The candidacy of the Internationalist List/MLPD for the state elections in Thuringia in the second half of the year will give a signal for workers' unity in East and West. It will be a tactical offensive for genuine socialism and against modern anti-communism. This work is already becoming an important school of party building. In several cities of Thuringia we could already found MLPD party units of one or two persons and strengthen the existing groups of MLPD and Rebell. We want to participate in the preparation of the International Automotive Workers' Conference in South Africa in 2020. At the center of our international work, however, is the initiative for the establishment of a worldwide anti-imperialist united front against fascism and war. Here the ICOR reports currently on a significant success: In a top discussion between the Main Coordinator of the ICOR, Monika Gärtner-Engel, and José Maria Sison, the Chairman of the Coordinating Group of the ILPS, a joint initiative, a call and a determined, coordinated work of ICOR and ILPS were agreed upon. Thus the certainly strongest and liveliest international revolutionary associations have allied themselves for this great task. In 2019 we will also celebrate 50 years of our theoretical organ REVOLUTIONÄRER WEG (Revolutionary Way). It is in this spirit that the Central Committee, under the editorial direction of Stefan Engel, the head of the theoretical organ, is systematically working on issues 36/37 of the REVOLUTIONÄRER WEG series. Under the title "The Crisis of Bourgeois Ideology and the Doctrine of the Mode of Thinking", the many debates regarding world outlook will be treated as preliminary skirmishes for the coming class battles and mass struggles. Everything that humans do, thus also a future international socialist revolution, must first pass through their minds! In this sense, in 2019 we will also carry out intensive training and educational work in all our activities, as well as intensive self-study guidance among our members and among the masses. In short, we have set our sights high for 2019 and will undoubtedly emerge stronger. I would like to thank our party members and many friends very much for their great willingness to work and take over responsibility, for their initiative and solidarity, and wish all of us every success! Liquidationism: petty-bourgeois forces in the working-class movement whose views and actions lead to the disintegration, division and destruction of the organizations of the working class. International Coordination of Revolutionary Parties and Organizations, comprising 52 organizations from 47 countries. International League of Peoples' Struggle, ILPS, is an anti-imperialist and democratic association formed in 2001 by 218 mass organizations from 40 countries.